In 1896 it was discovered that uranium constantly emitted rays more penetrating than X-rays; such rays also made gases conduct electricity. This field was next studied by Marie and Pierre Curie. They found that other heavy substances emitted such rays (gamma rays). They analyzed pitchblende a uranium compound, and found it contained polonium and radium, the latter being a strong emitter. They realized the emission must be caused by some behavior of the atoms in the materials; they called this behavior "radioactivity". 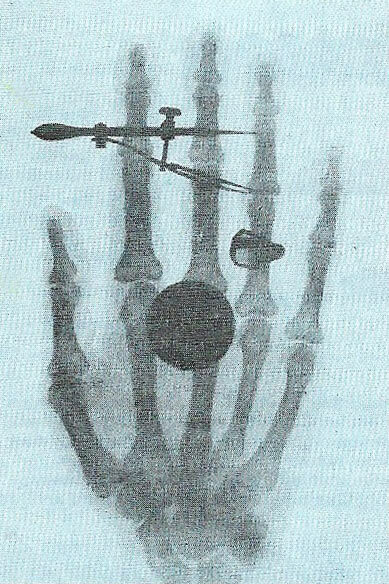 The illustration shows Marie Curie's hand photographed using a gamma-ray source. 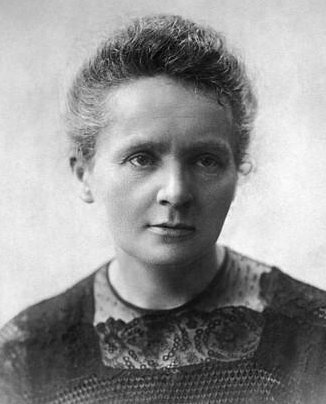 Marie Curie was a Polish-born French physicist, born Marja Sklodowska, who, with her French-born husband Pierre Cure (1859–1906), was an early investigator of radioactivity, discovering the radioactive elements polonium and radium in the mineral pitchblende (1898). For this the Curies shared the 1903 Nobel Prize in Physics with Henri Becquerel. After the death of Pierre, Marie went on to investigate the chemistry and medical applications of radium and was awarded the 1911 Nobel Prize in Chemistry in recognition of her isolation of the pure metal. She died of leukemia caused by long exposure to radiation. Pierre Curie is also noted for the discovery with his brother Jacques of the piezoelectric effect (1880) and for his investigation of the effect of temperature on magnetic properties. In particular he discovered the Curie temperature, the temperature above which ferromagnetic materials display only paramagnetism (1895). The Curies' elder daughter, Irène Joliot-Curie, was also a noted physicist. In the autumn of 1891, Marie Sklodowska, as she was then, arrived in Paris from Warsaw, and joined the science faculty at the University. She was very poor and had been saving up for years in order to scrape together enough money for her studies. In Paris she lived in an attic that was bitterly cold in winter and suffocatingly hot in summer; for weeks on end she lived on nothing but bread and chocolate. But she was happy being able to study and attend lectures by some of the world's greatest scientists. In 1894, Marie began working in the same laboratory as Pierre Curie and his brother, who were doing research in electro-physics. Marie and Pierre became great friends, and 18 months after they first met they were married. While the Curies were working in the small laboratory of Henri Becquerel a remarkable thing happened. Becquerel had left a package of uranium salts in a dark room on the top of a light-proof photographic plate; when he developed the plate he found that an impression of the salts had formed on it – this despite the fact that both had been wrapped up in paper. Becquerel guessed at once that the uranium salts were giving out spontaneous rays so he started to investigate the problem. When he carried out the same experiment using pitchblende (the chief mineral of uranium) he found that the photographic reaction that took place was much stronger than in the case of pure uranium salts. He realized that the pitchblende must contain another substance that gave off many more spontaneous rays than uranium. Becquerel knew the Curies and their capabilities and so he asked them if they would like to undertake some research on the subject. Marie was very enthusiastic and persuaded her husband to agree. She was convinced that the impression on the plate was made by some unknown element. The Curies then gave up their other experiments and devoted themselves to looking for this new element. They were given a small shed at the school of physics; this they turned into a laboratory and it was here that some of the greatest discoveries in chemistry were to be made. The Curies wrote to the Austrian government explaining what they had undertaken and asking for some of the pitchblende residues that existed at San Joachimsthal, in Bohemia. Here uranium salts were used in the manufacture of glass. A few days later about a ton of pitchblende was unloaded in front of the Curies' laboratory. A period of unceasing work began. They would spend the whole day stirring huge masses of boiling pitchblende with a large iron stake. The suffocating fumes made the room an inferno and the bitter smoke made their eyes and throats sore. However, day after day the two scientists carried on. Marie suffered most, but never stopped or complained. By the time the ton of pitchblende had been reduced to about 100lb, the Curies isolated a new element that was 300 times more powerful in its effect on a photographic plate than uranium. Marie called it polonium after her country. They were still not satisfied, because there remained a substance that was even more powerful than polonium and so the work began all over again. Smaller and smaller amounts of concentrates appeared on the old tables of the shed until at last in 1898, many months after they had begun their work, Marie saw the final product – a minute amount of white opaque dust that looked rather like kitchen salt. It was radium chloride. Their goal had been reached (it was, however, not till 1910 that Marie Curie and A. Debierne successfully separated radium metal). The Curies told the world about their new element, which was two million times more 'radioactive' (as Marie Curie was the first to call it) than uranium. Their discovery was received with tremendous enthusiasm by all scientists, the discoverers became famous and were given many honors and awards, including a Nobel Prize. During the time of this research Marie had had two children, Irene and Eve. Irene was to become a famous scientist herself and in 1935, she too received a Nobel Prize. In 1905 Pierre was elected to the French Academy and was appointed professor of physics at the University. But then tragedy struck. Thursday, April 19, 1906, was a wet day. About 2:30 in the afternoon, Pierre was coming out of the Faculty of Sciences. As he crossed the Rue Dauphine, he absentmindedly walked out from behind a carriage and found himself facing a huge horse drawn cart. He tried to catch hold of one of the horses but he slipped on the ground and fell. The cart, which weighed 6 tons, went over him and he was killed instantly.